The action against the Kwik-Fit Group has been brought by the Performing Rights Society which collects royalties for songwriters and performers. At a procedural hearing at the Court of Session in Edinburgh a judge refused to dismiss the £200,000 damages claim. Kwik-Fit wanted the case brought against it thrown out. Lord Emslie ruled that the action can go ahead with evidence being heard. The PRS claimed that Kwik-Fit mechanics routinely use personal radios while working at service centres across the UK and that music, protected by copyright, could be heard by colleagues and customers. It is maintained that amounts to the "playing" or "performance" of the music in public and renders the firm guilty of infringing copyright. The Edinburgh-based firm, founded by Sir Tom Farmer, is contesting the action and said it has a 10 year policy banning the use of personal radios in the workplace. The PRS lodged details of countrywide inspection data over the audible playing of music at Kwik-Fit on more than 250 occasions in and after 2005. It claimed that its pleadings in the action were more than enough to allow a hearing of evidence in the case at which they would expect to establish everything allegedly found and recorded at inspection visits. 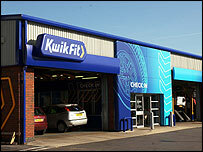 Lord Emslie said: "The key point to note, it was said, was that the findings on each occasion were the same with music audibly 'blaring' from employee's radios in such circumstances that the defenders' [Kwik-Fit] local and central management could not have failed to be aware of what was going on." The judge said: "The allegations are of a widespread and consistent picture emerging over many years whereby routine copyright infringement in the workplace was, or inferentially must have been, known to and 'authorised' or 'permitted' by local and central management." He said that if that was established after evidence it was "at least possible" that liability for copyright infringement would be brought home against Kwik-Fit. But Lord Emslie said he should not be taken as accepting that the PRS would necessarily succeed in their claims.